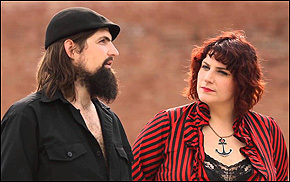 CHARLESTON, S.C. (Hypebot) – Recently, my band Megan Jean and the KFB was contacted by Relix Magazine to be included on a sampler CD they include with all of their issues, which boasts a readership of of 360,000 people worldwide. They said they loved our music over there at Relix, and we thought that was awesome. Their magazine is all about breaking up-and-coming bands, and has been doing so at a grassroots level for decades. The CD comes bound inside every issue we print (over 100,000 copies). Tracks normally run for about $3,000. HOWEVER, as a first time advertiser I would like to offer it to you for $1,800. Basically a steal considering its going to hit thousands of ears across the country. I can package the track with an On the Rise spot for a total of $2,000. The On the Rise spot is about the size of a business card and can contain the images of your choice, text and website of your choice. The track will also come with a 50 word bio in the magazine and will be placed on Relix.com to be streamed for free, so there is an online component as well….Also, each track that is submitted has the opportunity to have that album reviewed and placed in our album review section….Only catch is, we would need a really quick turnaround…we master and burn the compilation this coming Monday!" Now the Musicians are being courted as First-Time Advertisers, with no more mention of our music, or our talent. The exchange had changed course, from feeding on the hopes and dreams of a struggling musician, to presenting a "deal" for a first-time advertiser. Well, which category do DIY musicians fall into? Are we struggling artists, desperate enough to believe a well-known music magazine like Relix would or could ever simply stumble across our music and *gasp* like it enough to give it a break? Or, are we small business owners who know and understand the value of advertising and paid placements in well-read trade magazines? Realistically, DIY musicians need to be both, but Relix is hoping for the former, which is exactly why they use this classic ACT NOW sales tactic. They are counting on your desire to have your music heard at all costs, so they couple it with a rushed 5-day deadline will make you jump on a coveted spot that had "opened up," and normally wouldn't even be offered to you. The trick is to look not at the offer, but at WHO is offering it. Is it a sales rep, or a journalist? I have no problem with paid placements, but I think both music-makers AND music-lovers need to be aware of their existence in major music publications. I also have no doubt that there is some measure of legitimate exposure that comes with paying to be included on such a sampler. The issue I take with this practice however, is that it's predatory and dishonest, not only to the bands who believe they are being contacted on the merits of their music, but also to the readership who believe that Relix Mag dutifully seeks out and promotes the finest up-and-coming bands in America. Relix magazine's tagline is "It's all about the music," and not "It's all about who paid enough for us to write about them." Keep in mind, Relix was started in 1974 as a newsletter to connect people who bootlegged Grateful Dead concerts. With offers for paid placements in "Up and Coming" articles and album reviews written for a fee, just how much of Relix nowadays is comprised paid placements? Moreover, as a band, is that the kind of music-mill press you'd like for your yourself? As a music-lover, is that the kind of music you'd like to be listening to from a magazine you turn to for inspiration? As far as bands considering this sort of offer, reach out to other bands who have been featured, and ask them if they thought it was worth the money. I guarantee you'll get a better picture that way. If you feel the exposure is worth the price tag, and you have those resources available to you, then it's more of a calculated risk than a swindle. But first, consider all the things $2000 will buy your DIY band (for us, that's 2000 cds, which sold at $10 a piece will net us $18K in profit, a much tidier sum). $2000 is also roughly the cost of a small online content-marketing campaign though a PR agency, which might also be a more organized, genre-specific, and focused way to to get your music heard. As to the larger and more philosophical questions raised, as to where to pour your heart out for a price, and where to turn to for inspiration? I find it's all a lot closer to home than you think. Local blogs at local venues and festivals, that's where you'll get your best start. After all, it's music fans that build a career, not paid placements.